Saudi Women Go For A Spin In Latest Challenge To Driving Ban : Parallels Saudi Arabia is the only country in the world that effectively bars women from driving. Women are making a renewed challenge to the ban by getting behind the wheel and posting videos in advance of a national drive-in set for Saturday. 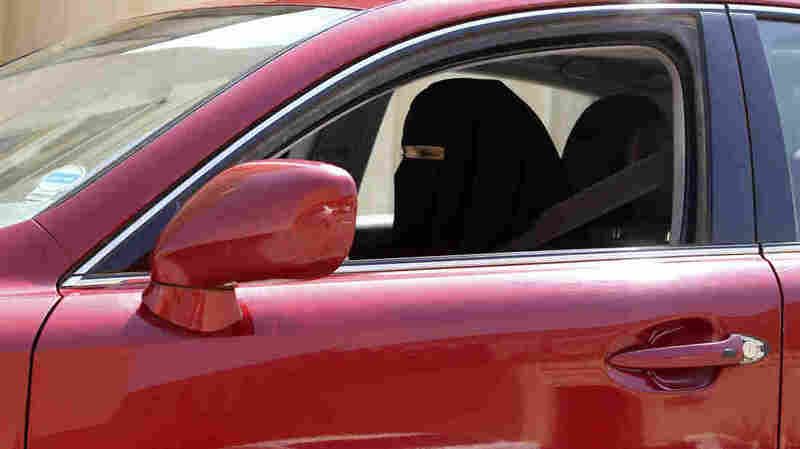 A woman drives a car in Saudi Arabia on Sunday. Saudi Arabia is the only country where women are barred from driving, but activists have launched a renewed protest and are urging women to drive on Saturday. Activists in Saudi Arabia tried once, they tried again and now they're making a third challenge to the kingdom's long-standing ban on female drivers. Some women have recently made short drives, posting videos on social media sites, and many more are planning to get behind the wheel on Saturday. Saudi Arabia is the only country in the world that effectively prohibits women from driving, a ban supported by conservative clerics. While there is no law formally banning female drivers, the government does not give them licenses. Government authorities seem to be more lenient these days, however. Sara Hussein, 32, says it's time to claim the right to drive. "Think back in history — Rosa Parks was the only person who sat down on the bus, wasn't she? And then it started to happen gradually," Hussein says. "It does have to start with the few brave people who are willing to risk whatever there is to risk." Hussein's mother, Aziza al-Yousef, who is in her 50s and teaches computer science at King Saud University, is a key organizer of the drive-in. Activists set Saturday as a date for a national road rally, but also encouraged women to just get behind the wheel any time. "We are saying, 'Just go ahead and drive now,' " says al-Yousef. "I know women started driving. The messages are in the hundreds. We are counting the videotapes." Activists have been challenging Saudi Arabia's ban on female drivers by taking to the road and posting videos. Here is one of what organizers say are 100 videos posted so far. The mother and daughter say the videos are coming from across the kingdom and even show one man teaching his wife and sister to drive. Saudi Arabia was made for driving, with wide open spaces and cheap gas. The sprawling capital, Riyadh, is as big as Los Angeles, with no dependable public transportation. Women must rely on men to drive them around. They may be male relatives or drivers who are part of the country's imported labor. But this is expensive and an intrusion into their lives, many women say. As the country changes bit by bit, the prohibition on female drivers can contradict other efforts by the government. For example, the government is urging private companies to hire more women. It is hard to see how that can happen unless women can drive to work, Hussein says. "No one has been given orders from higher up" to arrest female drivers, she adds. Al-Yousef says this campaign, the third challenge to the driving ban, has learned from past mistakes. In 1990, 47 women made the first attempt to challenge the ban. They all lost their jobs, were prohibited from traveling for years, and were shunned for their defiance. The next challenge came in 2011, when activists Maha al-Qatani was the first Saudi woman to get a traffic ticket. The campaign fizzled after some women were jailed for driving. But soon after, King Abdullah said women could vote in local elections, and 30 women were appointed to the 150-member Shura Council, an advisory body to the king. Al-Yousef — who has an international driver's license — says she and other drivers don't want to break laws aside from the one banning driving. She now takes a short drive every day and invites me to join her for a cruise around the capital. We get in the front, her male driver climbs in the back, and we take to the road. "I need people to see that it is normal; we have to let people accept it," al-Yousef says. "It doesn't mean anything if you drive only one day." The afternoon traffic is so heavy that nobody notices two women in the front seat of a car. Then we approach a police station. "Let's see what their reaction is," she says. "You watch it; it's going to be on your right." She says the head of the national police stated publicly that his officers would not arrest women for driving. But they will ticket those without a license, which is impossible for a woman to get here. Al-Yousef drives like a pro. She learned while attending a university in the U.S. The only time she shows excitement is when another activist calls her. "I am driving!" she announces with a distinct rise in her voice. We end our drive at her front door, where her husband is waiting to meet her. "Hello, I'm a coward. How do you do," her husband, Moisen al-Haydar, says with a laugh. Al-Haydar says he's given up driving. He's proud of his wife for braving Riyadh's hectic traffic. He supports her driving campaign, but he's worried, too. There have been online threats and insults against activists. Al-Yousef filed a case this week against the attackers in court. Also this week, conservative clerics urged King Abdullah to stop Saturday's drive-in, but the king did not meet with the complaining clerics. Al-Yousef sweeps away her husband's concerns and sits down to check the latest driving videos. "We've had four today and we are now up to 100 videos," she says as she turns up the volume on the latest driving demonstration. Al-Yousef translates the Arabic in the video: "She says this is a very positive movement; Saudi ladies should have the choice to drive her own car. And she named the tape, 'Yes, we can.' "
The final decision is up to the king, who has said he believes women have the right to drive, but hasn't said when.